Imagine you are in a museum, admiring a beautiful painting of a large, old galleon sailing into the sunset. Okay, nice enough. But what if that ship actually sails outside the boundaries of its frame? What if seeing that ship approaching you makes you feel jittery ? Now, that’s a whole level of visual and mental adventure, isn’t it? 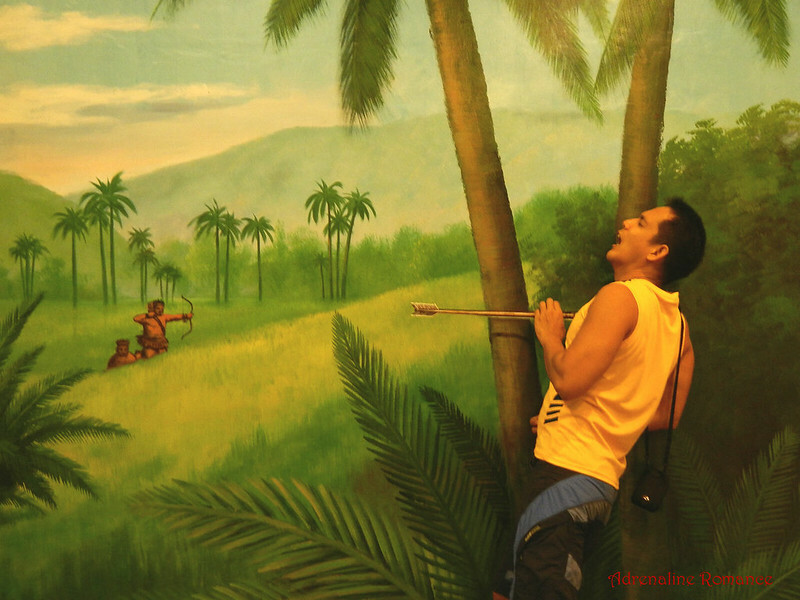 This is what Cebu Happyworld Museum is all about. 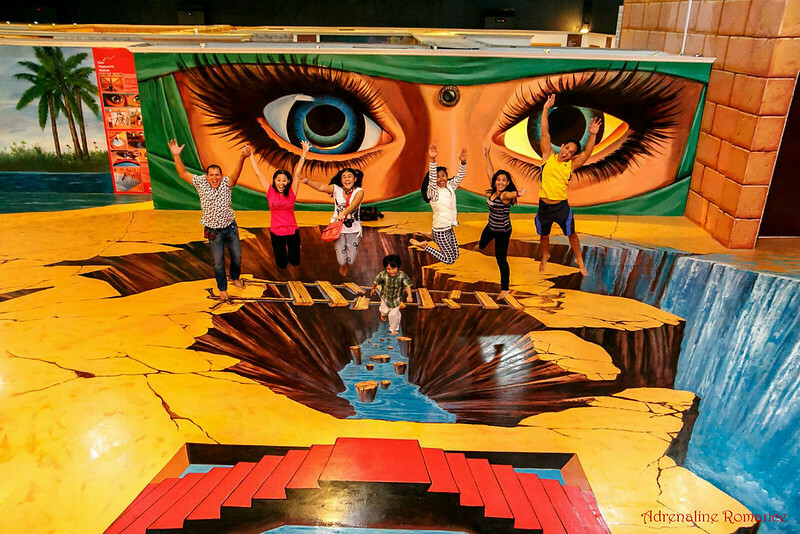 Located in Barangay Gabi in the island of Cordova, this one-of-a-kind museum features more than 70 superb three-dimensional paintings, interactive art, and optical illusion exhibits. 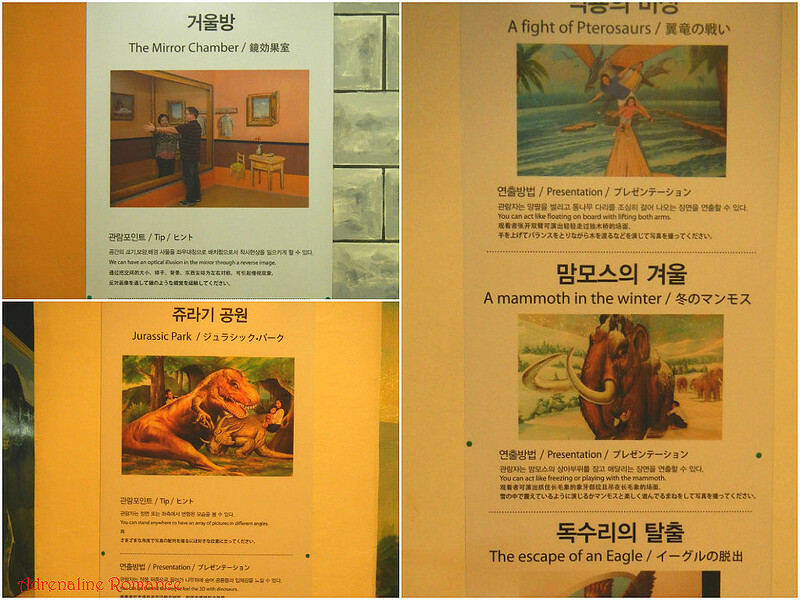 All these artworks are created by talented Korean artists. Let’s go and have a look. 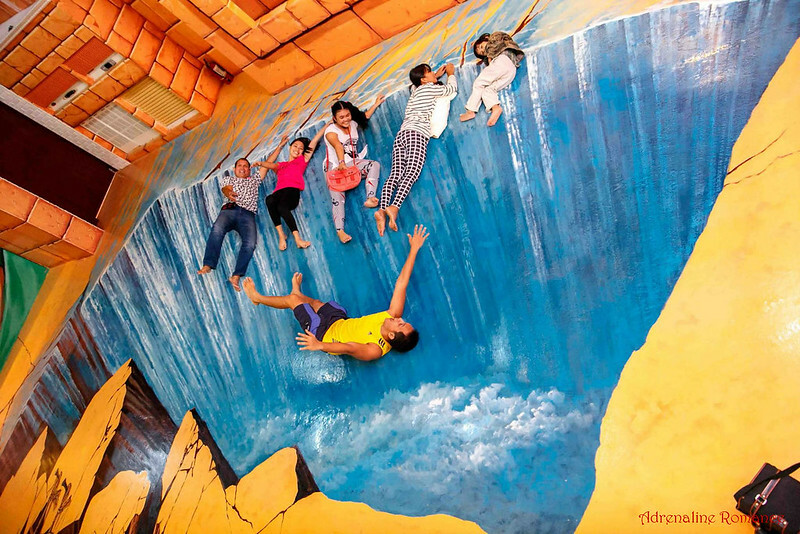 This cool museum is located just 15 minutes away from where we live! Now, that’s a pretty cool facade. 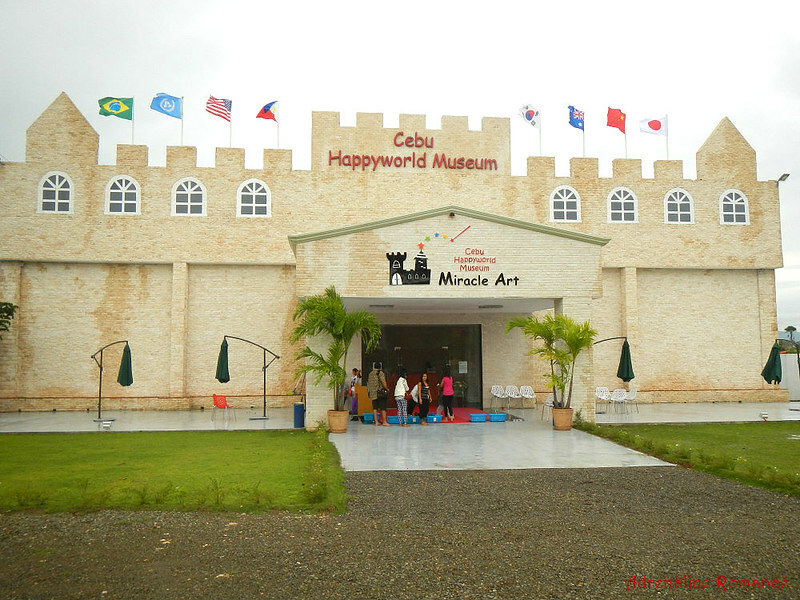 The Cebu Happyworld Museum is housed in a castle-like building. The structure itself invites people to open up their minds and let their imagination run wild. No worries if you’re bringing your own vehicle. 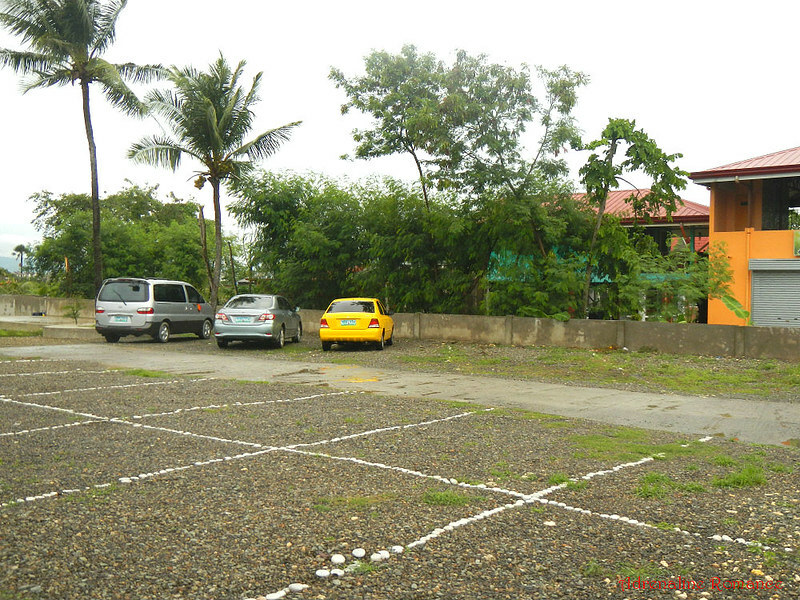 The museum has a huge parking space in front of the building. 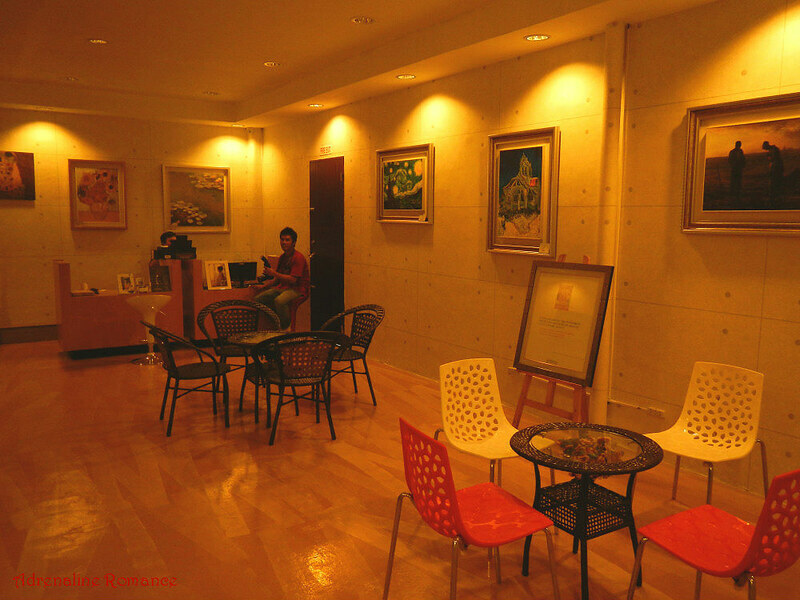 To maintain the interior’s cleanliness, wearing of shoes in the museum is not allowed. You walk barefoot on the cold, hard floor, which is quite uncomfortable and exhausting. It would be better if the facility offers flip-flops to patrons. Wearing light footwear makes touring around the museum more comfortable. Furthermore, wearing slippers is more hygienic than walking around barefoot. Don’t worry about your dear shoes. 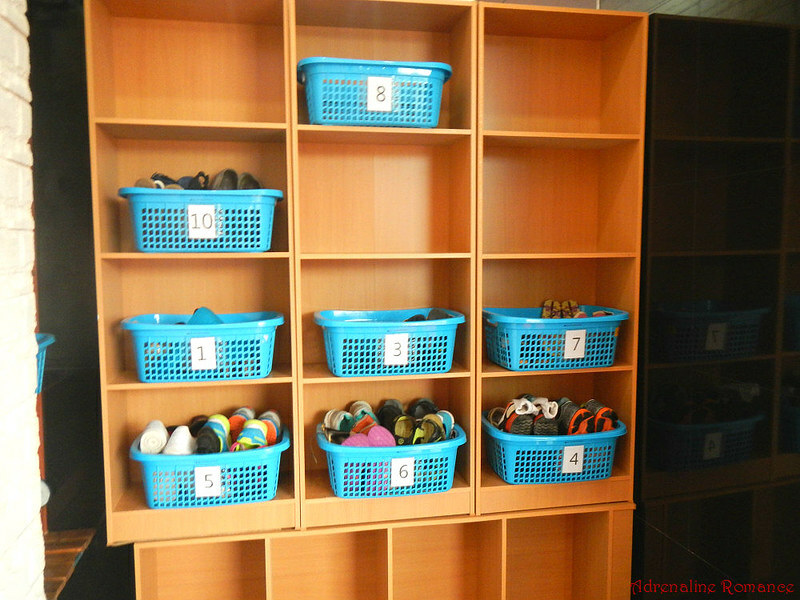 They will be safely stored inside these shelves. 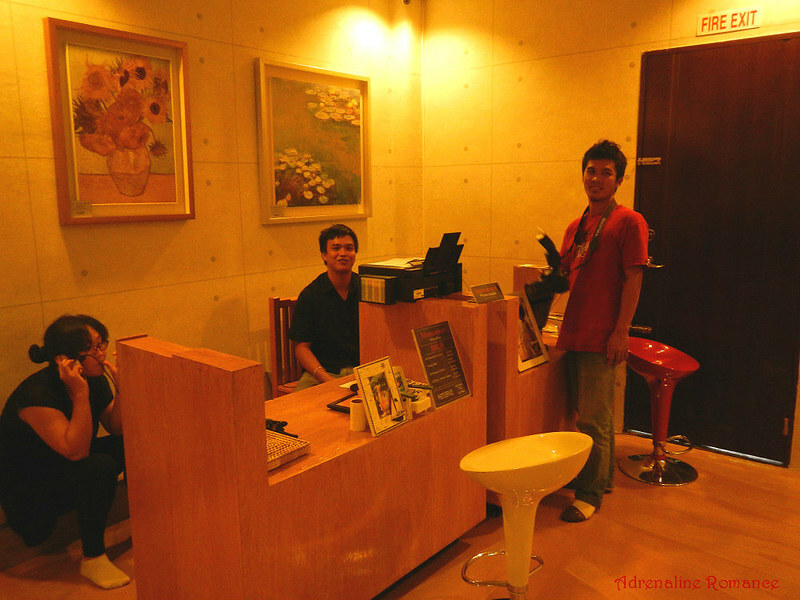 Pretty and friendly receptionists and staff make sure that your tour inside the museum is pleasant and memorable from the time you take off your shoes to the time you wear them back. 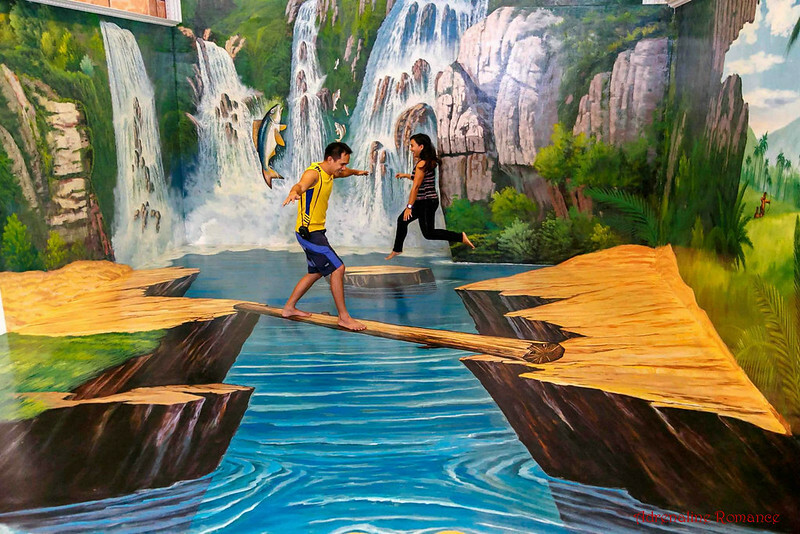 Upon going inside, you would see large wall paintings such as these. They seem pretty ordinary, aren’t they? Nope, they’re not. 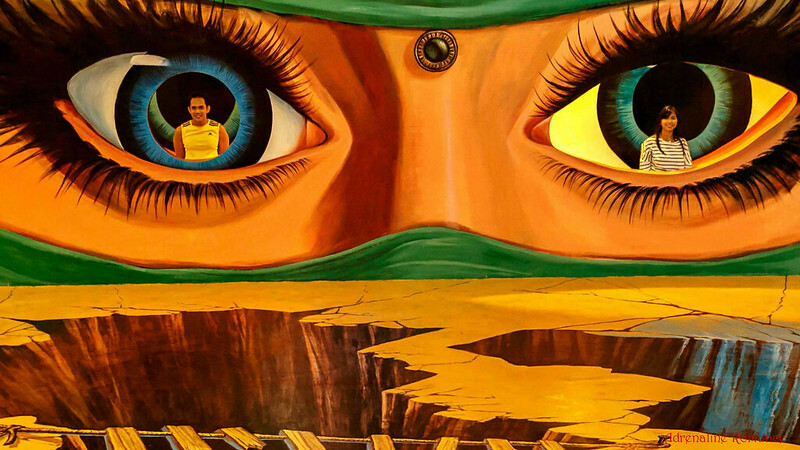 These are superbly made, high-quality 3-D paintings. 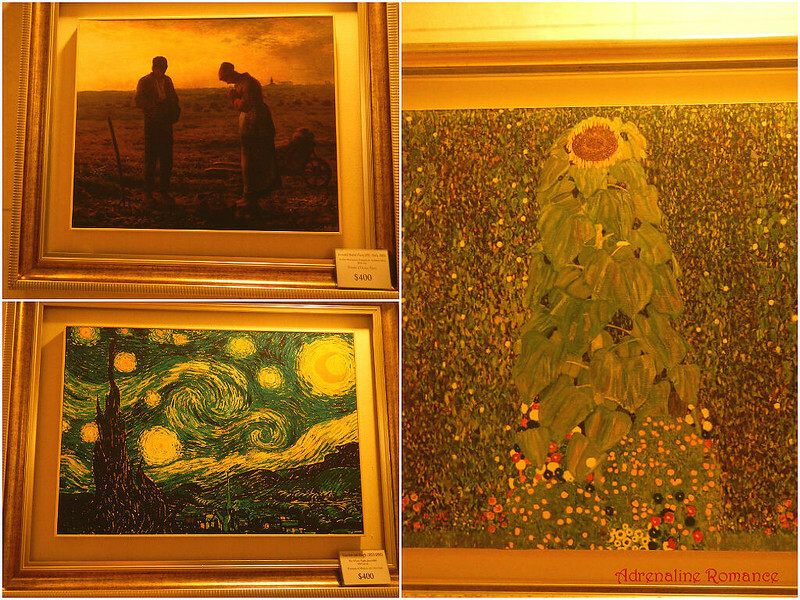 What’s so special about these paintings, you may ask? Well, when you pose a certain way in front of it, it would seem that you’re doing something to it! 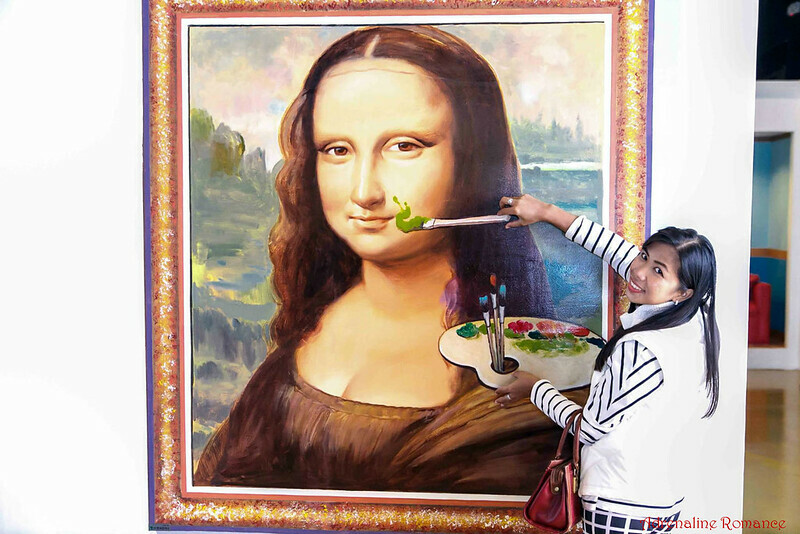 Here, my sister-in-law, Didin, added a personal touch to Leonardo Da Vinci’s Mona Lisa. I was a little thirsty since I wasn’t able to drink a glass of water before we left. Good thing that the Roman goddess of love and beauty Aphrodite bought a whole jug of water for me. 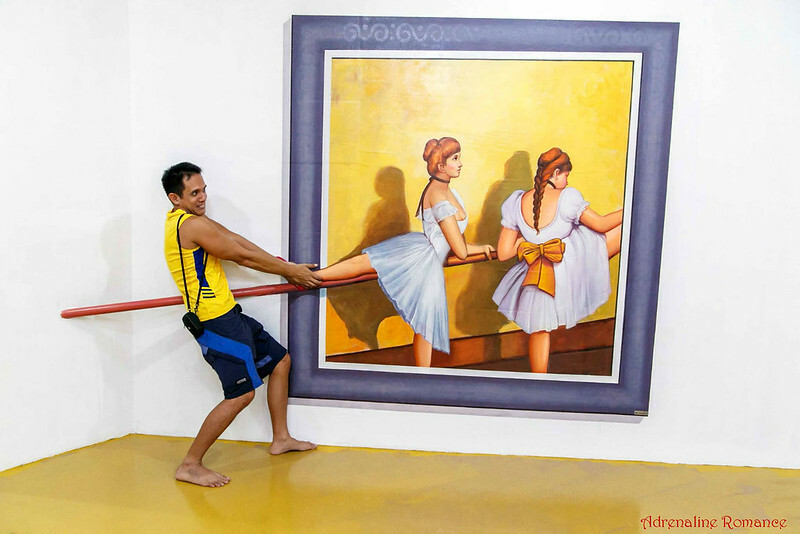 Let me help you with that foot, miss ballerina! 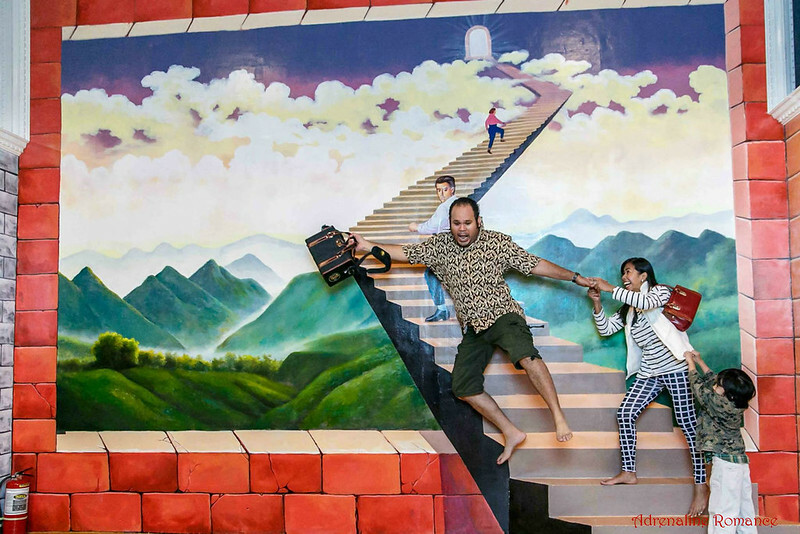 Aside from three-dimensional paintings, the museum also features exhibits that play with visually perceived images that are actually different from objective reality—optical illusions, in short. 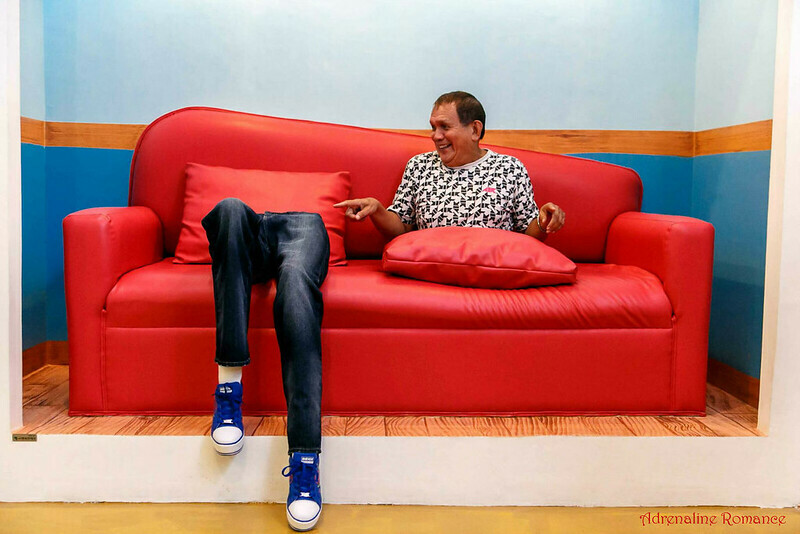 In this exhibit, my dad seems to be cleanly cut in half! What’s my Sweetie’s head doing on a basin outside a home? Catch them, Sweetie! 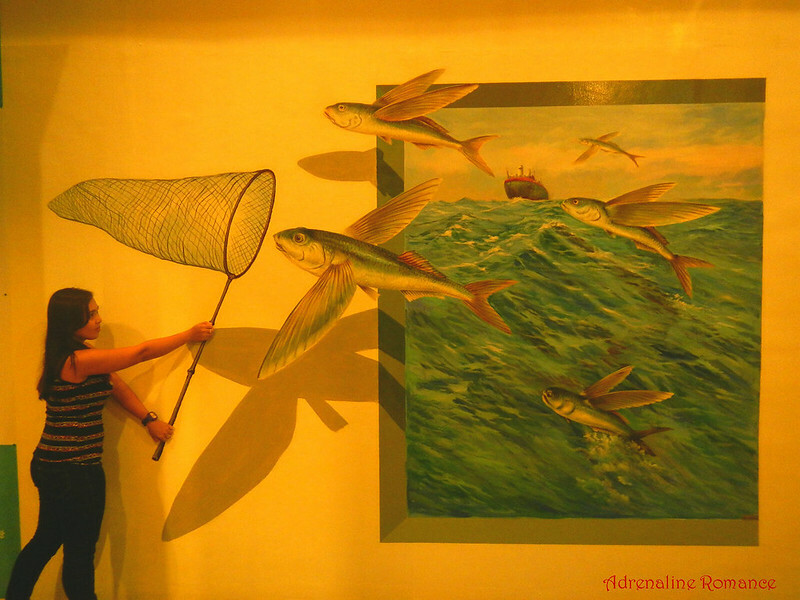 Enormous flying fish seem to jump out of the painting. 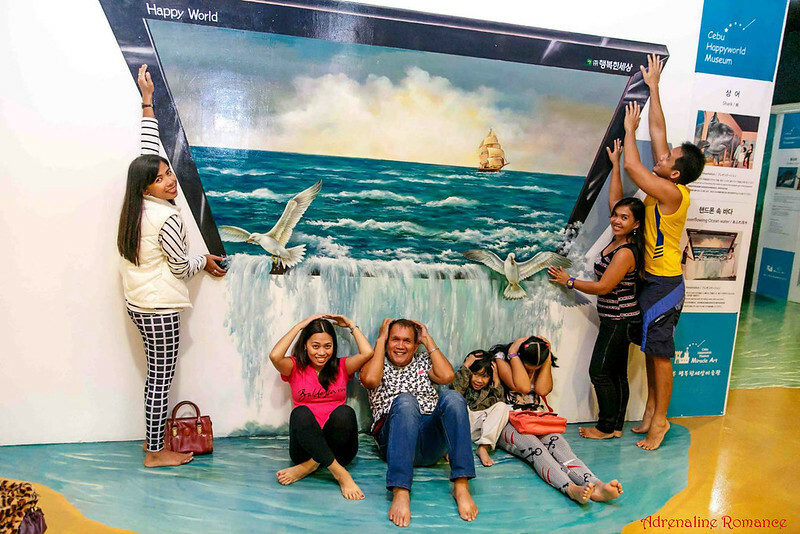 Here’s another cool 3-D painting, depicting pouring a blue ocean of water from a gigantic LCD TV. I ain’t going to die without a fight! Come on, tiger, let’s see what you got! 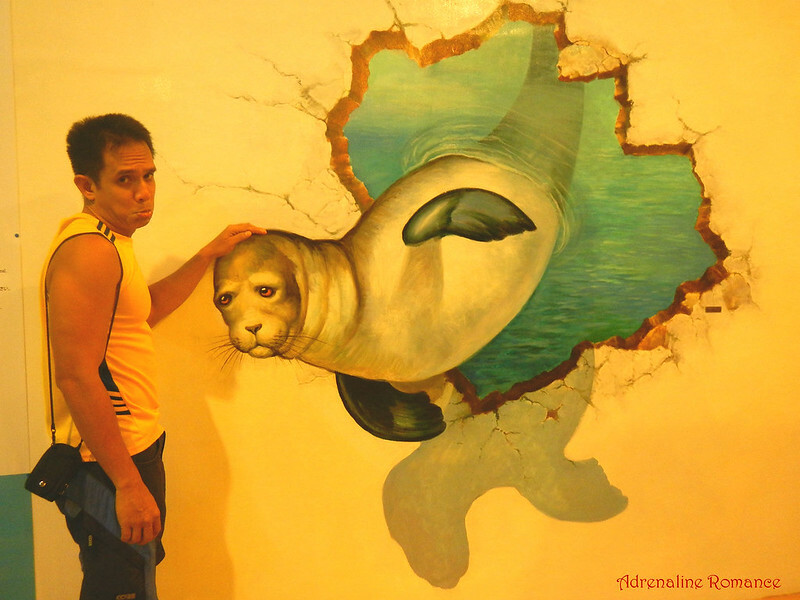 Now, that’s a really sad-looking seal. Oh, crap! Don’t eat me! 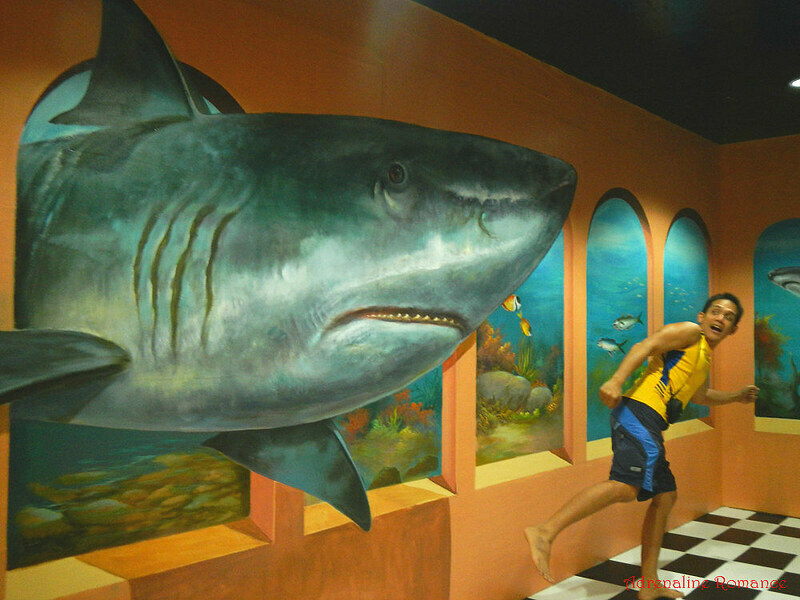 Some of the paintings, such as this shark painting in the Oceans Section, actually look very realistic. Attacked by a ferocious tiger, chased by a gigantic shark and now shot by hostile tribesmen, this seemed to be my unlucky day! How many times do I have to die? 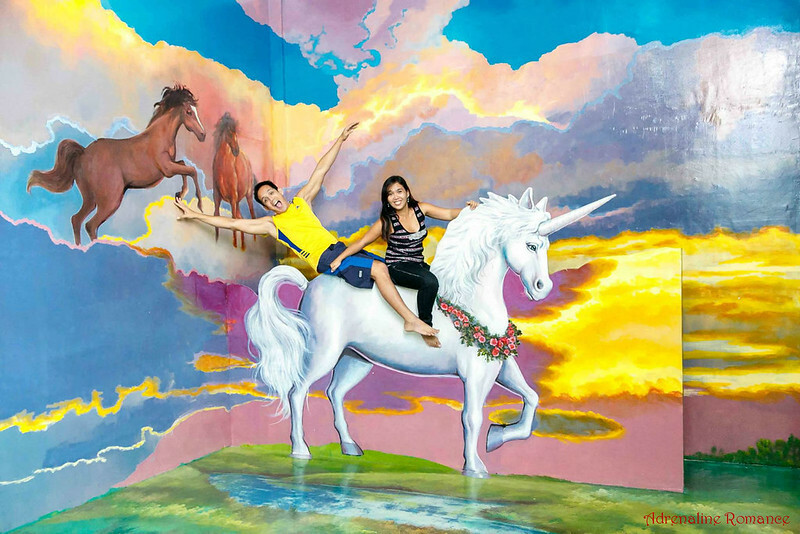 Tired of the real world, Sweetie and I rode a unicorn to dreamworld. Hehehe! Actually, that’s just a cutout of a unicorn. There’s a bench at the unicorn’s back where you sit down. 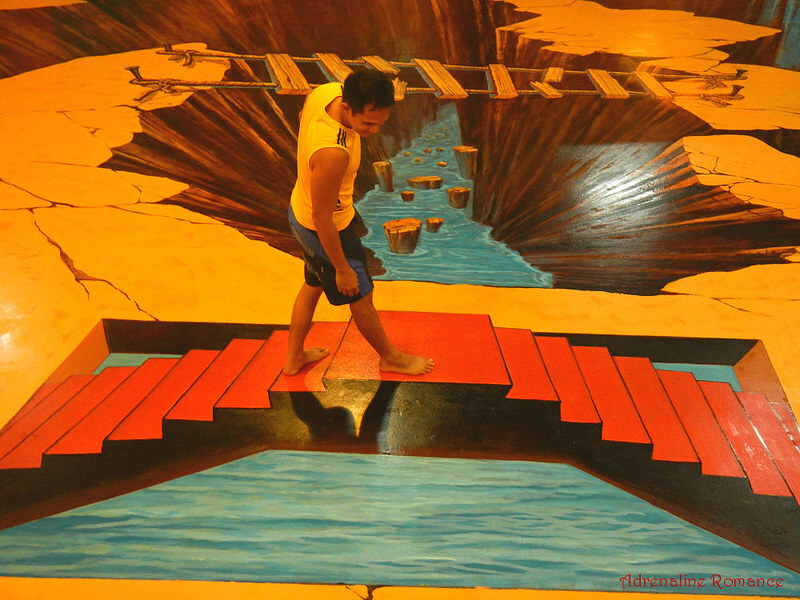 Optical illusions galore! Attuned to the Force, Sweetie seemed to be hovering on thin air! My bro fell while climbing his way on the stairway to heaven. That’s a cool mirror illusion. 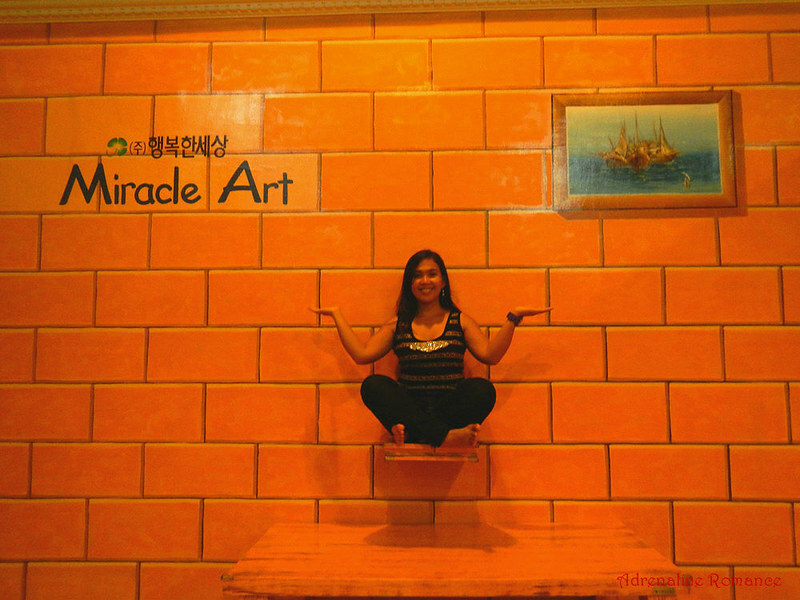 This is one of our favorite illusions. I seem to tower over my brother who, in reality, is actually bigger and taller than me. 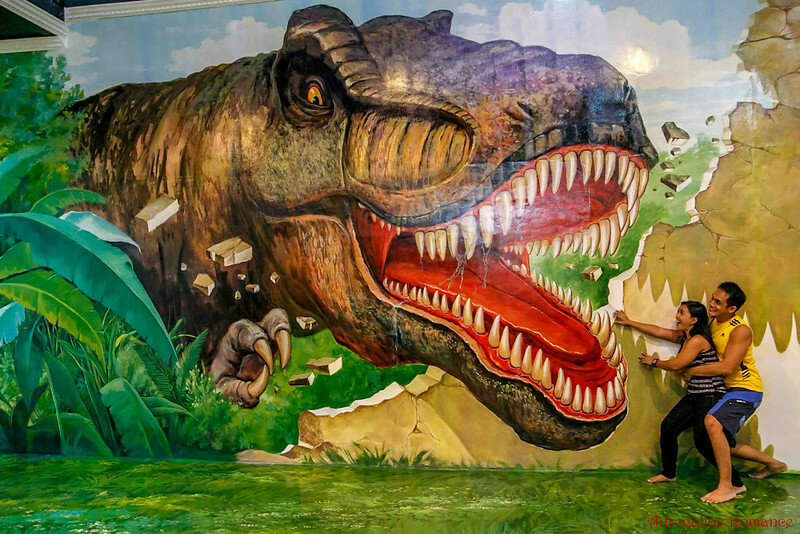 The museum also features professionally painted cutouts. We’re back in the Jurassic era! 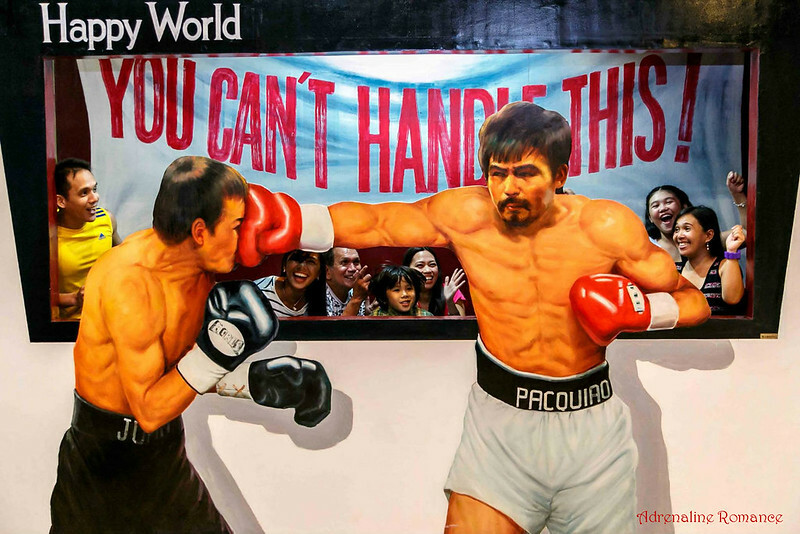 Go, Manny Pacquiao, go! 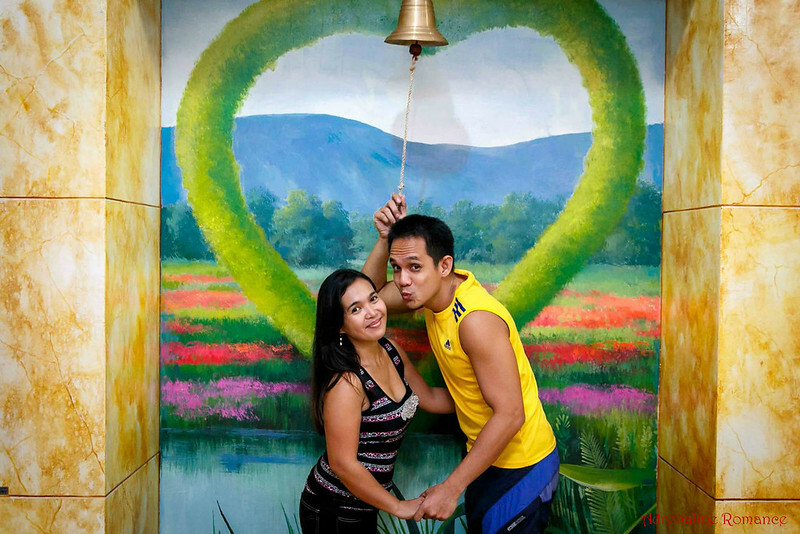 It’s glitzy Las Vegas here in Cordova, Cebu; and we’re right at the ringside! Don’t worry if you don’t know how to pose or where you should take a photograph. 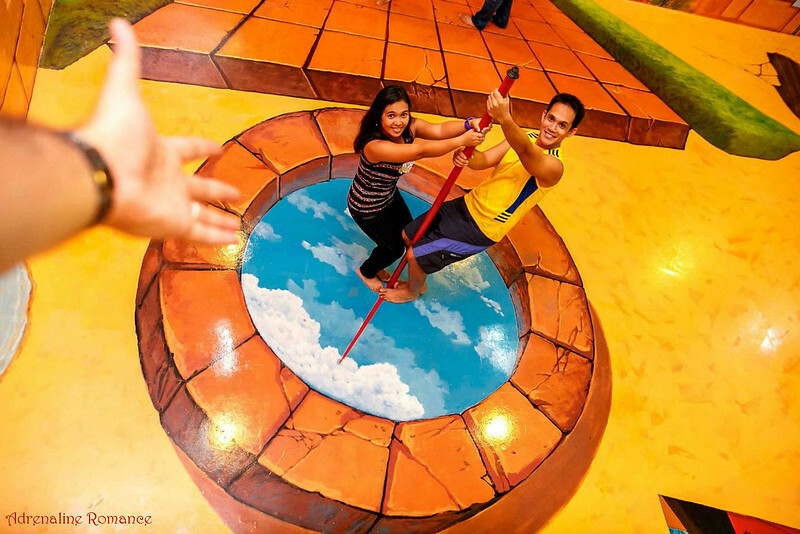 Each painting or interactive exhibit has easy-to-read instructions on what to do. English instructions also have Korean and Japanese translations. Dammit, not you again! Help! Alexa’s a pretty angel! 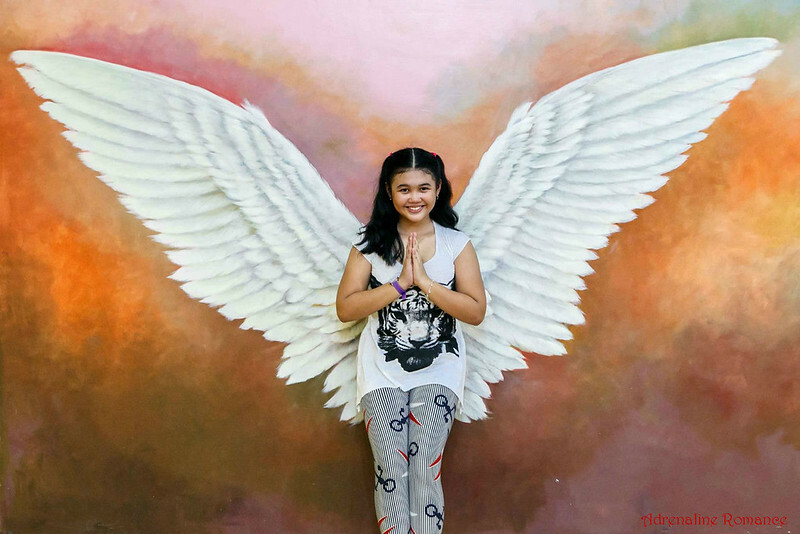 The wings are painted on the wall; you’ll just have to stand and lean between them. Are we in the romantic, flower-filled country of Holland? In just a few minutes, we were teleported to ancient Egypt overlooking the mighty Nile River. First, there’s a tiger, then a shark. Then a group of hunters and now, a T-Rex? Run for your lives! Different eye reflections? How can that be? 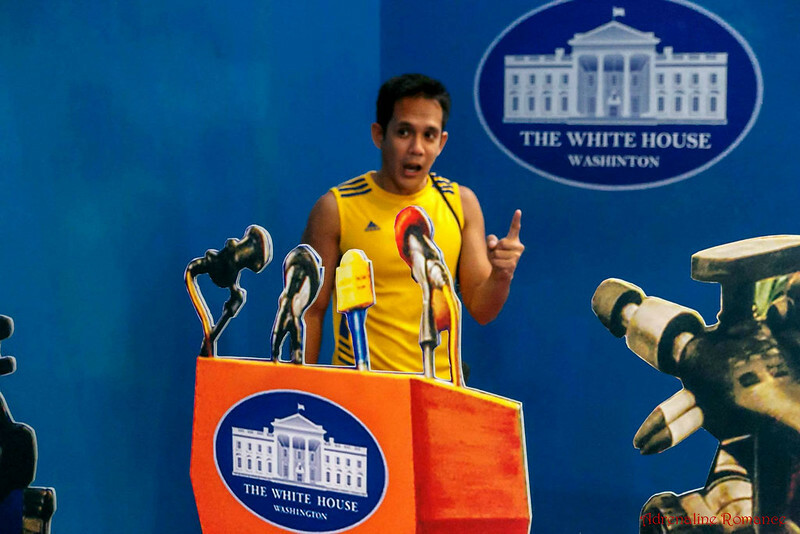 I’m the president of the United States holding a press conference! Don’t worry if you don’t have a camera. 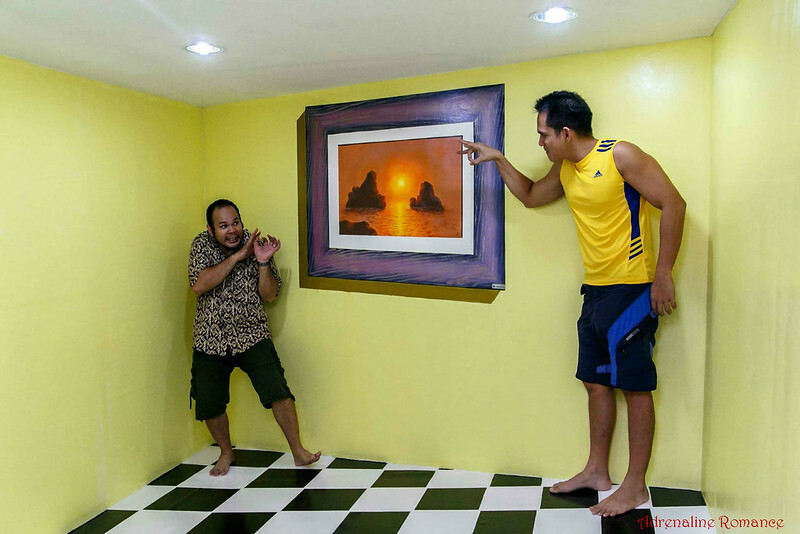 These guys will take memorable photos of you levitating in the air, being cut in half, feeding buko juice to a shark, etc. 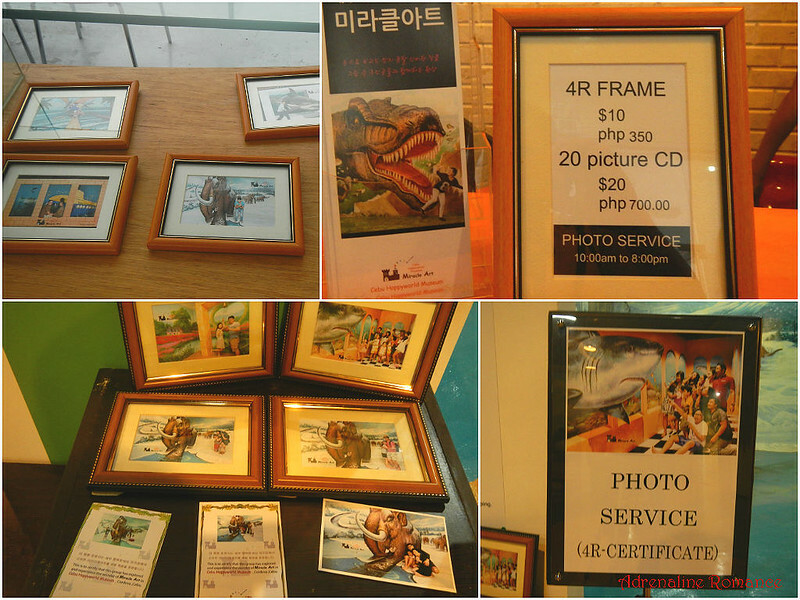 You can have your favorite museum photo framed or printed on a certificate for a fee. Touring around the museum can be quite tiring. Don’t worry. You can just sit down and take a break in their small café. Light snacks, soft drinks, and juices are available at affordable prices. 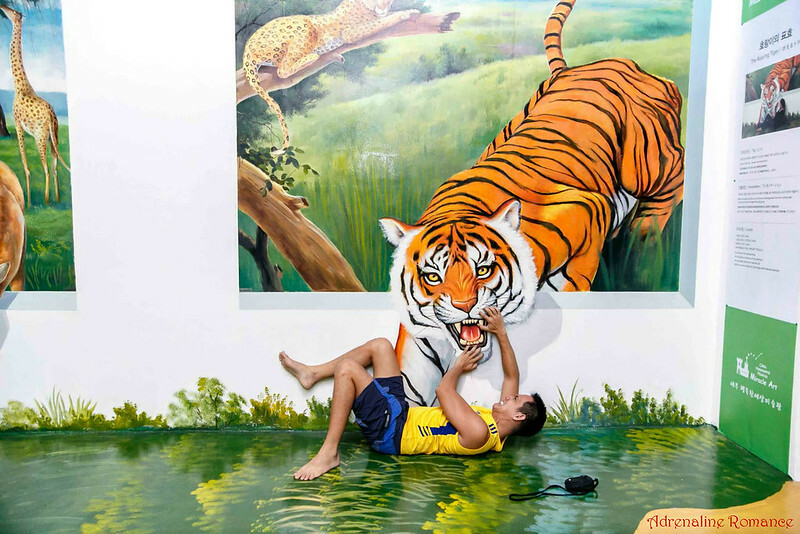 While taking your snacks, you can marvel at the superb paintings that adorn its walls. Many of these nice paintings are actually for sale, so if you’re an avid art enthusiast, you may want to take home one or two of these. After a short break, it’s time for more illusory adventures in the wild! The last area in the museum is also the largest—and full of really deep ravines! A brick well above the clouds! Don’t look down if you’re afraid of heights! Falling over a massive waterfall! Help! 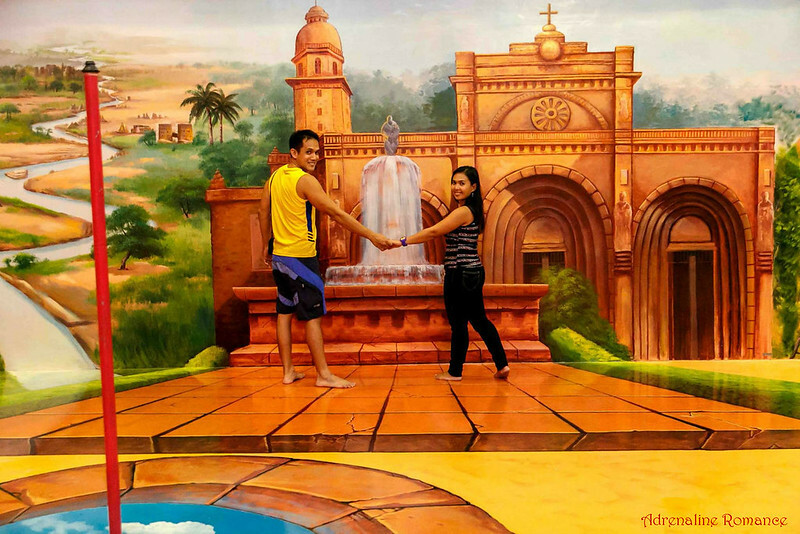 Even though it wasn’t an adventure in the typical sense of the word, our visit to the Cebu Happy World Museum on a rainy Sunday is truly fun! Not only were we able to play around with the magnificent paintings and stimulating exhibits, but we were also able to admire and respect the creative minds behind these amazing pieces of artwork. 1. 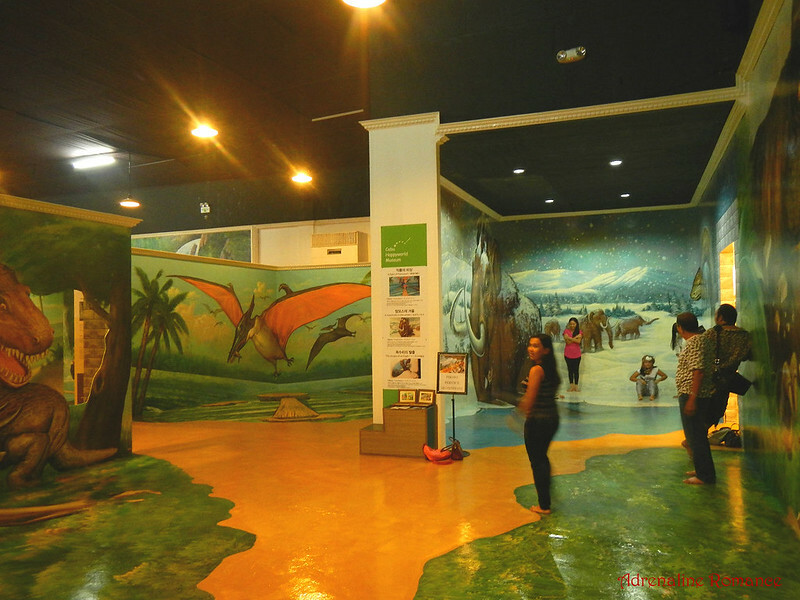 To get to Cebu Happyworld museum via public transportation, take any jeep in Lapu-Lapu City, Pusok Road, or the airport that goes to Cordova. Fare is around P10 to 12. Ask the driver to let you disembark at the Cordova crossing, which is actually the main square. 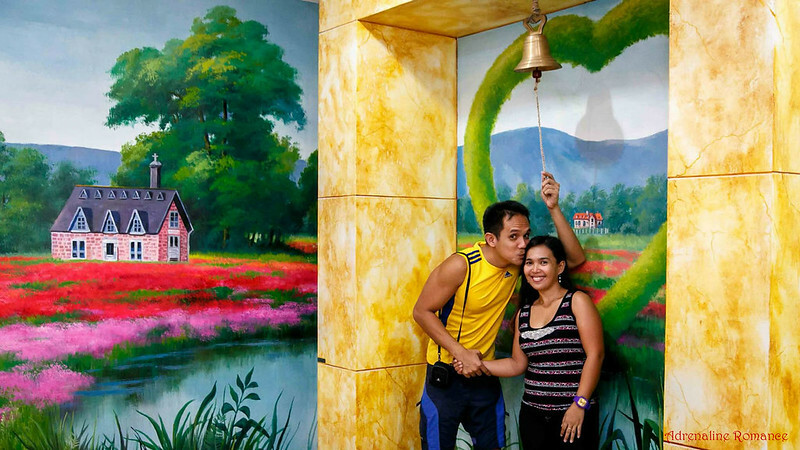 Take a tricycle going to Barangay Gabi and tell the driver to drop you off at Cebu Happy World Museum. Fare is P8. Note that fares may change without prior notice. 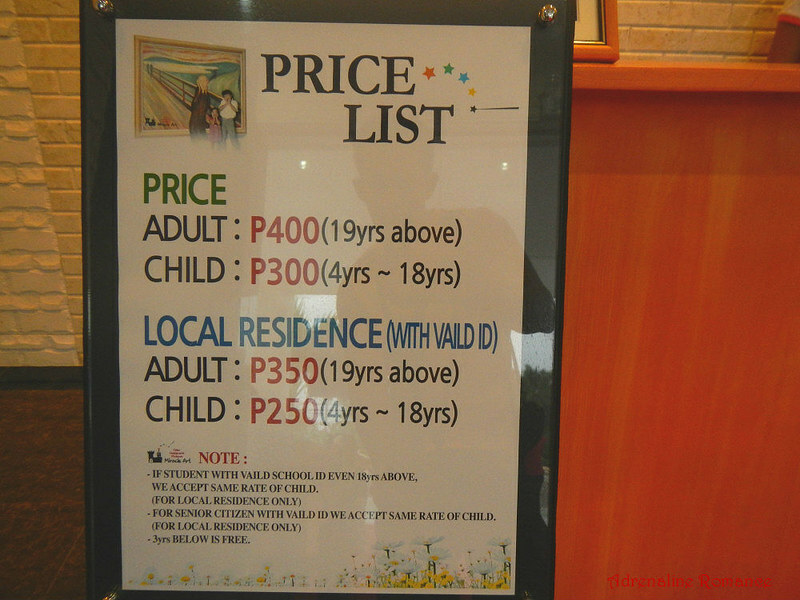 Rates are subject to change without prior notice, so it’s best to contact the museum for updated rates. 4. 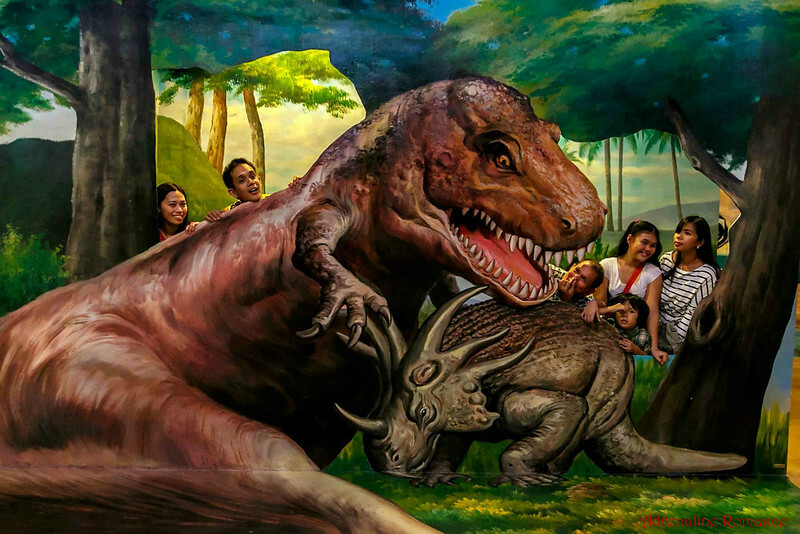 There are over 70 paintings and exhibits divided into 6 sections (World Famous Art, Religious Beliefs, Ocean, Jurassic Animal, Philippine Pride, and Ending Sections). 5. Wear flip-flops, open-top laceless shoes, or other kinds of footwear that is easy to take off. 6. If you don’t like the idea of walking around barefoot, bring on some lightweight indoor walking sandals, those fluffy ones you wear at home. Tell the representatives that you’d prefer walking with something on for hygienic purposes; most likely, they’ll allow you to walk with your sandals on. Hi… How can we get to cordova from lapu.lapu church(birhen sa regla near fairy boat port)? 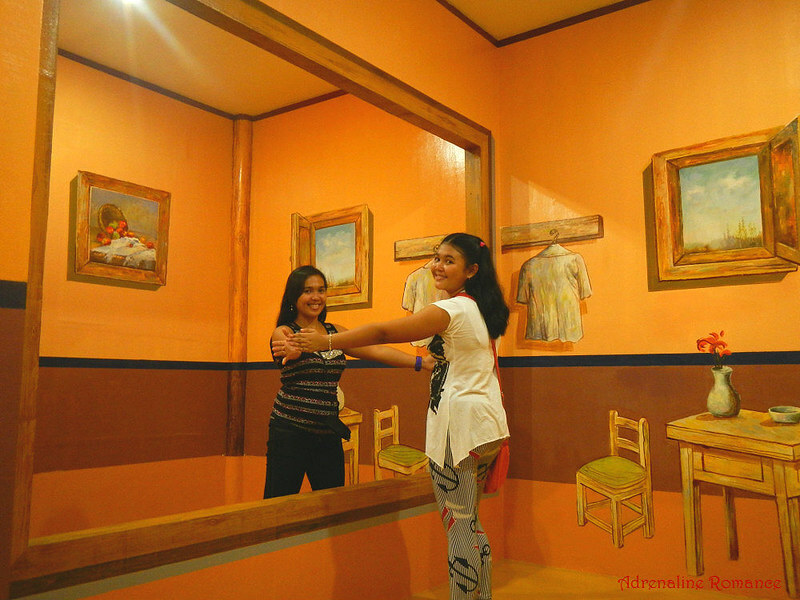 where particularly in cordova would we stop by jeepney? (i mean to the road on the way to happyworld? )what will we tell to the driver? Please check out Tip 1. Cordova-bound jeeps also pass by the Muelle Osmena Pier. Thanks. Hi, per head ning Entrance ? Hi. Kasali naba sa P400 yung service fee sa magti-take ng picture? 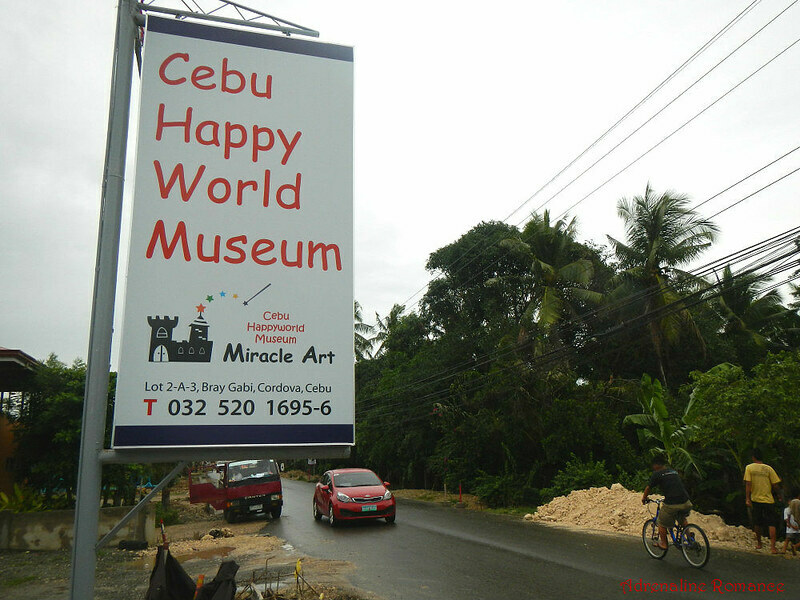 Please get in touch with Cebu HappyWorld Museum. Thanks! Very nice pose sir ! i will include this to my bucket list to-do to-explore. Indeed! They have added some more facilities. If I recall correctly, they now have an outdoor playground and a “bump-boat” (similar to bump cars) pool. It would be best if you would contact them. The rates here may have changed.